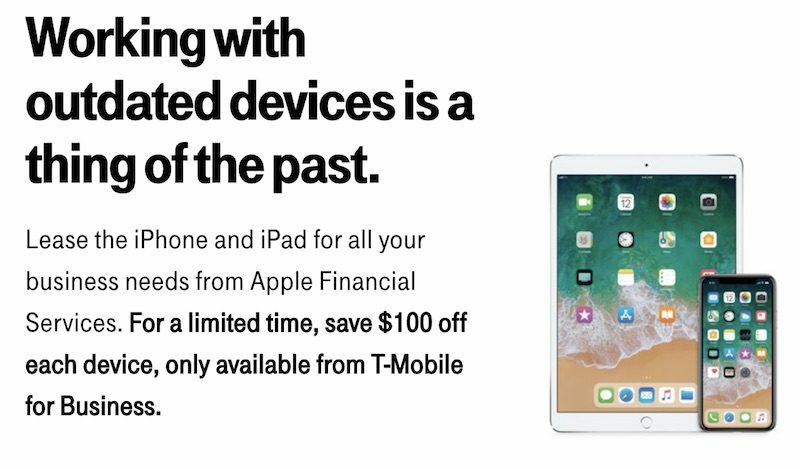 T-Mobile today launched a new iPhone and iPad leasing program for businesses in partnership with Apple's Financial Services. Under the program, qualifying business accounts activating 25 or more lines with T-Mobile can lease iPhone and iPad models with no upfront costs, and lower monthly installments versus purchasing the devices outright. By leasing instead of owning, businesses pay only for their usage of the devices, with the option to upgrade to the latest models each year. For example, businesses can get an iPhone 8 for as low as $18 per month. Paired with unlimited talk, text, and data through T-Mobile ONE for $25 per month, the monthly out of pocket cost is as low as $43 per line. In addition, while purchasing devices upfront or through a financing plan is a capital expenditure, leasing devices over 24 months through Apple can move the cost to an operating expense for financial flexibility. For a limited time, T-Mobile says it will cover the first $100 of every iPhone and iPad leased through the program. Businesses can sign up for the program, and learn more, on T-Mobile's enterprise website.